Broken into two volumes on the main level and clad in weathered gray cedar, the house responds to the neighboring small-scale beach cottages. There is no formal front door, but upon arrival there is a fluid procession signifying entry - from the gravel autocourt, through the gates to a tree-lined entry court, and up to a covered entry deck. The covered deck is created by a spanning second story, defining the threshold between the public and private realms – the street to the backyard. Pulling apart the house’s volumes generates more opportunities for permeability between inside and outside for light, air and access. With sliding doors abundant around the house, it becomes just as natural to utilize outdoor connections between living spaces as indoor ones. Continuous decks wrap around the house, making it easy to run around in bare feet. A large trellis at the pool house creates a shady spot for lunch poolside, while cedar screen walls provide easy storage for pool toys. The screened porch – a connector between the built-in barbeque and the kitchen – can accommodate large groups with a table for ten and cozy seating around a wood-burning fireplace. The big backyard – shaded by an existing Paulownia tree – is preserved for the kids by pushing the pool to the south side of the site, which maximizes the afternoon sun when the clients return from the beach to jump in the pool. Roof decks off the second story family room feature another fireplace seating area, a swath of artificial turf for the kids to play on, a vegetable garden, and a separate hangout spot on the southwest deck for the kids as they get older. Inside, the clients wanted a minimal, white interior that would be light and bright, but would also hold up to their three young kids. For the house to function well and maintain a ‘clean’ look day-to-day, effortless storage was critical, so white acrylic built-ins throughout provide convenient places to hide toys, shoes, and beach gear. Laundry is tucked away behind pocketing doors just inside the front door, so sandy clothes and wet towels can go right in the wash after a morning at the beach. The open kitchen, dining and living room are wrapped in windows, allowing sunlight to fill the space throughout the day. Cedar ceilings are a warm counterbalance to the bright, white cabinets and Corian countertops. The master suite is on the main level, separated from the living space by the storage zone off the entry. 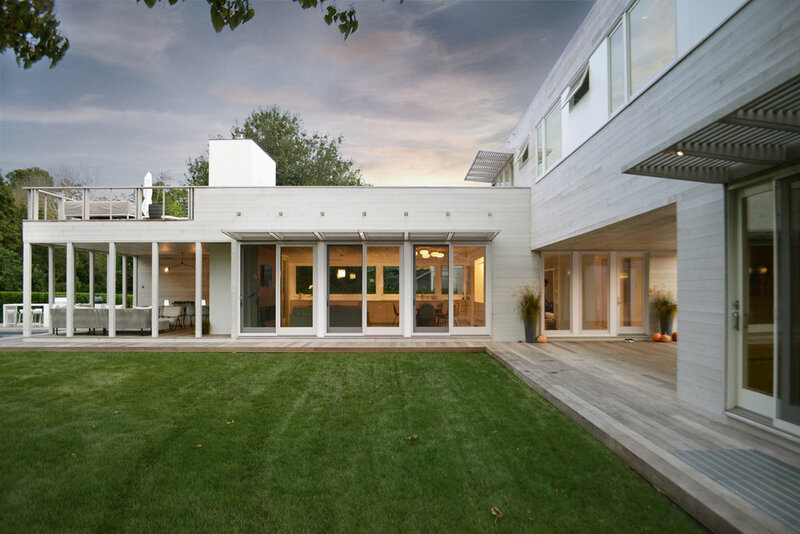 Large sliding glass doors open onto a private grassy outdoor space. The master bath is encased in full height windows, overlooking an existing Japanese maple tree. Another sliding glass door next to the tub opens to a private outdoor shower. The second main level volume houses a two-car garage, a guest bedroom and an office. The office is intended to serve as a man-cave hideaway, providing a quiet space for work and leisure that is still close enough to watch the kids playing in the yard. A stair from the office leads down to a home gym in the finished basement, which has two light wells to allow for natural light and air. Two more light wells in the larger basement open up to two more guest bedrooms and a large playroom.